President Donald Trump is coming to Utica on Monday to raise money for Claudia Tenney. Details have been emerging in recent days since the story was initially reported on Tuesday. 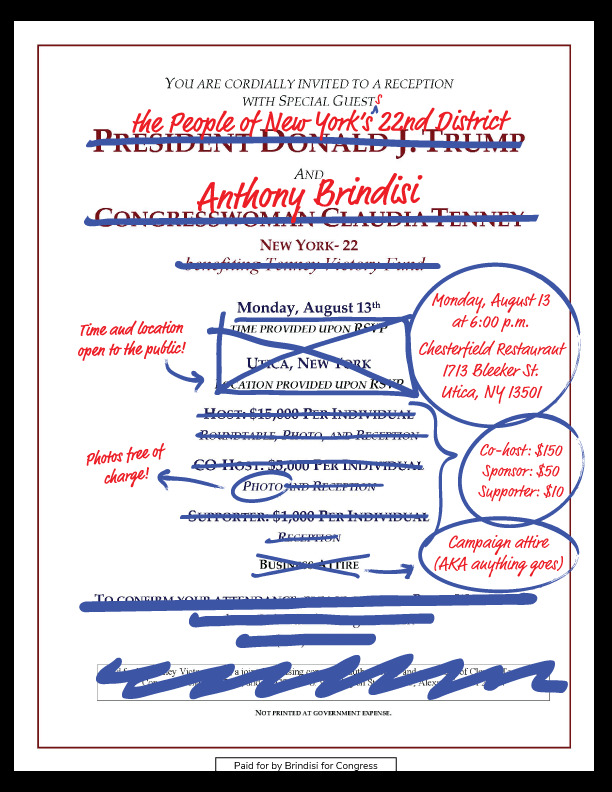 Trump’s appearance will occur at 4:30pm this Monday and only be open to donors to Representative Tenney. The location is made known when people R.S.V.P. per invitation instructions. "It's not going to be a big rally," explained Carl Paladino, former chair of Trump’s 2016 campaign in New York. "It's going to be a fundraiser." Paladino made news post election for his comments about Barack Obama, whom he wished got mad cow disease, and Michelle Obama, whom he compared to a gorilla from Zimbabwe. On Wednesday, Tenney said she put in several requests regarding the President’s visit and that a public rally “was our main ask.” (4:35 mark) Tenney is “very excited” and “absolutely honored” by the president’s visit, though claimed to have no control over Trump's schedule. Attending the fundraiser will cost at minimum $1,000. $15,000 purchases access to the reception, a roundtable, and photo with the president. Tenney has stated the event will be among the least expensive fundraisers undertaken by the president. No comprehensive assessments are available, though some anecdotal examples of Trump fundraisers (here, here & here) suggest the statement may be accurate. Trump’s visit to Utica will be the first by a sitting president since 1948, when Harry Truman did so as part of a whistle-stop train tour and addressed the crowd. Trump held a campaign rally in nearby Rome in April of 2016, which approximately 5,000 people attended. In July of 2017, the president prompted bipartisan criticism from political leaders in upstate New York after suggesting New Yorkers should leave the area to find work. This will be his first visit upstate since taking office.